Published on 03. 11. 2011 in comics and cartooning, commentary and criticism and hype & linkage. 1 Comment Tags: L'Association. 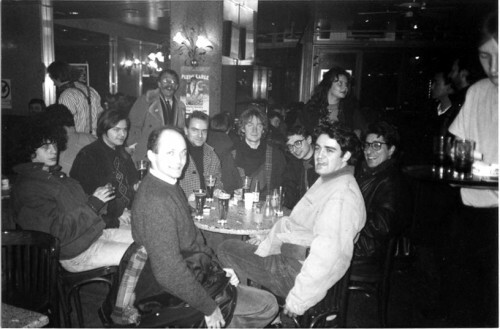 Mattt Konture, Killoffer, Stanislas, Lewis Trondheim, Jean-Christophe Menu, David B., Philippe Dupuy and Charles Berberian in Angoulême in 1991. Photo Courtesy lewis Trondheim. I’ve spent some of the summer interviewing a number of the central figures in and around seminal French comics publisher L’Association (publishers of Marjane Satrapi’s Persepolis and many other quality books) about the crisis they’ve been through over the last year or so. An interpersonal crisis that eventually led to a strike amongst the employees and resulted in the return of four of the publisher’s estranged co-founders as well as the departure of another, Jean-Christophe Menu, and his announcement of a new publishing house, L’Apocalypse. The first part is now up at The Comics Journal, with the second to follow soon. Part 2 is now online. Hop to it!